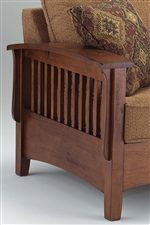 The wood frame, upholstered chair features mission style slats, gently arced base, and clean lines. Plush seat and back cushions finish the piece. Customize the piece by choosing from one of hundreds of fabrics to complete the piece. The Westney Upholstered Chair with Wood Frame by Best Home Furnishings at Saugerties Furniture Mart in the Poughkeepsie, Kingston, and Albany, New York area. Product availability may vary. Contact us for the most current availability on this product. The Westney collection is a great option if you are looking for Mission furniture in the Poughkeepsie, Kingston, and Albany, New York area. Browse other items in the Westney collection from Saugerties Furniture Mart in the Poughkeepsie, Kingston, and Albany, New York area.